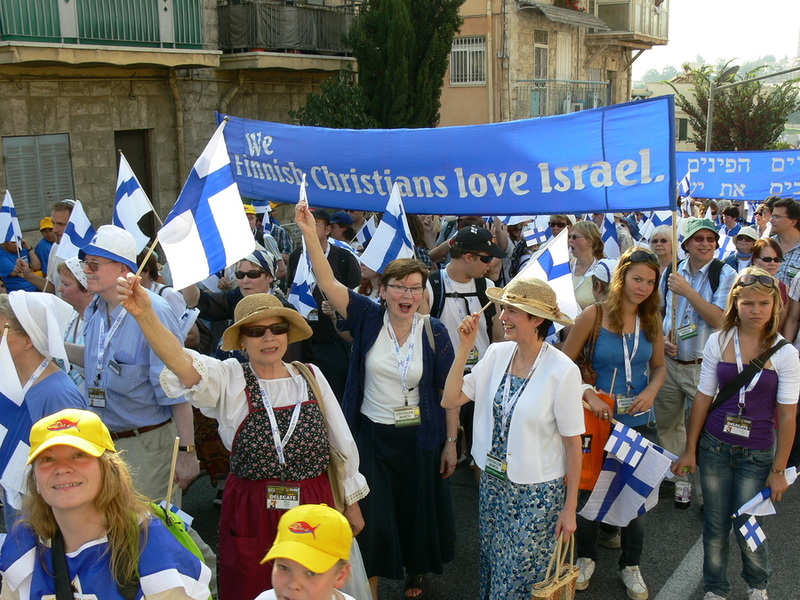 Although we have seen manifestations of Christian Zionism in Britain, for example Christians fascists made up a significant part of the Zionist counterdemonstrators at Sodastream (turning away more customers than even we managed to do) it is in the United States that there is a multi-million strong Christian Zionist community. Unlike the EDL/BNP loving Sussex Friends of Israel most Jewish groups in the United States are wary of the embrace of Christian Evangelist groups. 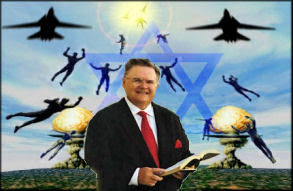 Christian Evangelist groups are fundamentalist groups which are, at one and the same time, both avidly Zionist and anti-Semitic. 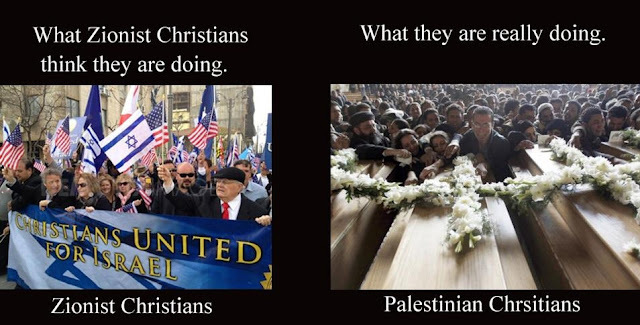 They certainly want Jews to ‘return’ to Palestine in order that they can then have the battles of Armageddon, Rapture and the mass genocide of most Jews. 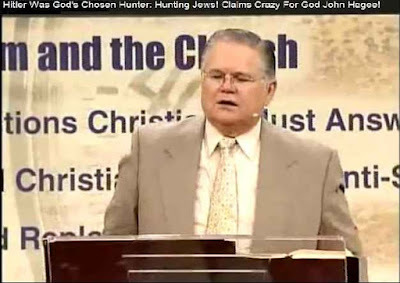 Most notable amongst the Christian fundamentalists is Pastor John Hagee, President of Christians United for Israel. Hagee it was who said that Hitler was a ‘hunter’ sent by god in order to ferret out the Jews from their hiding places and drive them to Palestine. 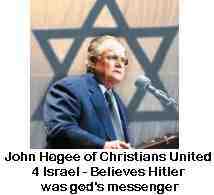 Not much different from Netanyahu you might think, except that Hitler was an agent of the Mufti. It was the Christian fundamentalists and Bible belt Christians who, during the holocaust, were the most vehemently opposed to the immigration of Jewish refugees just as today they are the most hostile to refugees and migrants as well as welfare recipients and anyone else down on their luck. It isn’t a Christianity of love your neighbour so much as beggar your neighbour! So most Jews in the USA tend to be liberal despite the leadership of the Zionists being vehement supporters of the neo-Cons and a pro-imperialist foreign policy. Nowhere was this clearer than on the agreement with Iran. Whereas most Jews were in favour of the agreement, by large majorities, the main Zionist lobby group, AIPAC campaigned fervently to block it in Congress. This article in Forward, a liberal, previously socialist publication, gives a flavour of these dilemmas. Is Evangelical Group a Useful Ally in BDS Fight— or Bigoted Albatross? Laurie Cardoza-Moore is responsible for one of the signal achievements in the battle against attempts to boycott Israel: a bill passed in the Tennessee state legislature condemning boycott, divestment and sanctions against Israel as anti-Semitic, before any other such measure reached the capitals of other states. These convictions catapulted Cardoza-Moore into leadership of a movement to stop the expansion of a mosque in Murfeesboro, Tennessee, where it had existed peacefully for 30 years, claiming it was part of a plot targeting Middle Tennessee because it is the heart of the Bible Belt. Through the organization she has founded, Proclaiming Justice to the Nations, and her own public statements, Cardoza-Moore has became a key player on two fields that many American Jewish leaders say they want to keep strictly separate: a staunch pro-Israel evangelical out to recruit fellow Christians, and a fierce crusader out to eradicate what she views as Islamic indoctrination in America’s heartland but who is often accused of deep-seated Islamophobia. 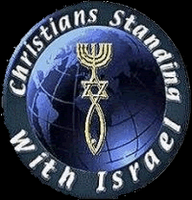 Nevertheless, with her clear message to Christians across the world via documentaries and web videos, Cardoza-Moore and her organization have become the darlings of American Jewish donors committed to fighting BDS. The group also strongly opposes a two-state solution to Israel’s conflict with the Palestinians, defending Israel’s permanent retention of the occupied West Bank and isolation of Gaza. 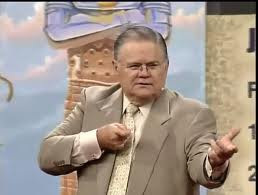 The pro-Israel evangelical advocacy scene has been dominated for the past decade by Pastor John Hagee’s Christians United for Israel, a national organization which boasts more than 2 million members and draws thousands to pro-Israel nights in Washington and across the country. PJTN is much smaller, with an annual budget of $559,000 in 2013 and only three full time staffers. But the group’s stress on media and its recent foray into anti-BDS activism have made the small Nashville organization a growing presence in pro-Israel circles. Cardoza-Moore, who grew up Catholic, discovered after visiting Israel’s Diaspora Museum in 2003 that she may be a descendant of Portuguese Jews forced to convert during the Inquisition. She began inquiring among family members, and heard that her great grandfather, on his deathbed, told his children about the Cardoza family’s Jewish roots. Last April PJTN was the driving force behind a resolution in the Tennessee state legislature that condemned BDS as a form of anti-Semitism. Though only declarative, the resolution, which passed easily, was the first such action taken by any state legislature. It was followed by legislation in South Carolina and Illinois that barred businesses involved with BDS from doing business with those state governments. Cardoza-Moore recently presented a framed copy of the Tennessee bill to Yuli Edelstein, speaker of Israel’s Knesset, during a three-week visit to Israel. While in Israel, she filmed her latest documentary, titled “Victims of Peace,” which, she said, will “expose BDS” as anti-Semitic. In the film, now in production, two Palestinians, one from Gaza and the other from the West Bank, tell Cardoza-Moore they are grateful to Israeli employers who hired them and that boycotting Israel will cause them to lose their jobs. Her work on behalf of Israel and taking on supporters of BDS have landed Cardoza-Moore and her organization financial backing from many Jewish donors known for their aggressive, uncritical support for the Jewish state. The Irving Moskowitz Foundation, which backs exclusively Jewish settlements in the Palestinian sectors of Jerusalem, provided PJTN with a $70,000 donation in 2013. 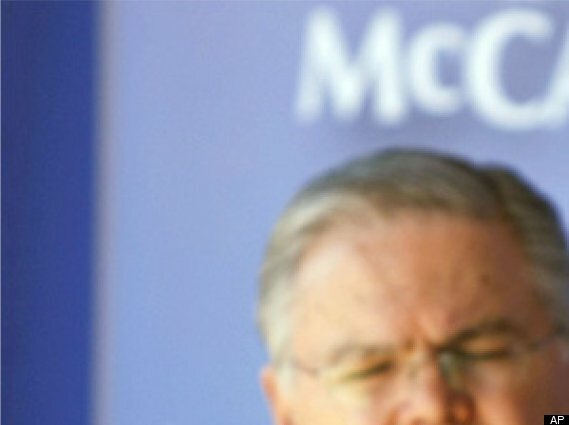 Other donors include Chicago’s Larry Hochberg, the former chair of Friends of the Israel Defense Forces, a board member of the Zionist Organization of America and a major donor to the American Israel Public Affairs Committee; conservative talk radio host Dennis Prager, and Israeli-American businessman Adam Milstein. PJTN was among the groups invited by Sheldon Adelson and other Jewish funders to attend the Las Vegas kickoff of what is shaping up to be the Jewish community’s most heavily funded anti-BDS operation, known as the Maccabees Task Force. PJTN, like other participants, is now expected to pitch the Adelson-led initiative with programs for funding. But while the group’s pro-Israel activity has been widely welcomed by the Jewish community, its anti-Islamic actions do not win broad support. The Nashville Jewish Federation made clear its cooperation with PJTN is limited to common interest areas concerning Israel and not to other activities of the group aimed at Muslim Americans. “It’s tragic when you see Jewish organizations join forces with anti-Muslim extremists, not only because of the obvious history of discrimination, but also because it is counter-productive on many levels,” said Ibrahim Hooper, national communications director of the Council on American-Islamic Relations. In 2010, the Anti-Defamation League filed an amicus brief against PJTN’s attempt to block building of the new Islamic center in Murfreesboro. ADL claimed that attempts by Cardoza-Moore and others to stop the Islamic center project and investigate alleged ties with extremists in Somalia and Gaza violated religious freedom. The group’s legal actions to stop the mosque’s expansion were ultimately dismissed by a federal appeals court in 2014 after a years-long battle. PJTN’s next project will be focused on what the group views as the threat of extremist Islamic content in school textbooks. “They’re indoctrinating our children with pro-Islamic rhetoric that violates the Establishment Clause,” Cardoza-Moore said. She pointed to a mention of Palestinian terror attacks against Israeli teens in a pizza parlor as raising the question of the whether terror can be justified. While PJTN’s main focus now is on BDS, it holds strong views opposing a two-state solution to Israel’s conflict with the Palestinians. 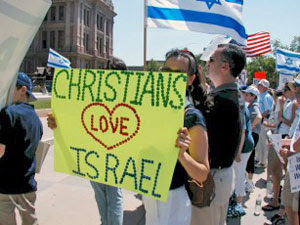 In 2013 Cardoza-Moore produced the film “Israel Indivisible: The Case for the Ancient Homeland,” which argues against division of the land into two states. This stance did not seem to prevent a group of five members of Congress, including California Jewish Democrat Alan Lowenthal, from going on a PJTN-sponsored trip to Israel in mid-October. Both Republican and Democratic administrations have publicly supported a two-state solution. Lowenthal is endorsed by J Street PAC, a dovish group whose main issue is promoting a peace agreement based on the division of the land.